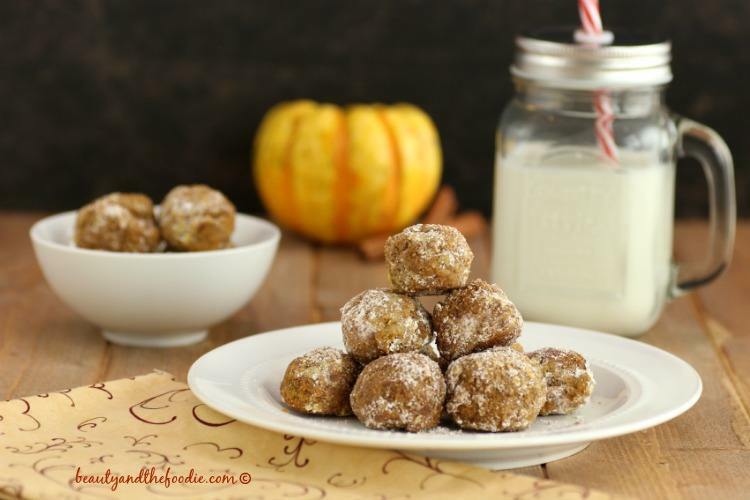 Pumpkin Pie Snowball Cookies are snowball cookies with pumpkin pie flavor. I converted my mother’s Russian tea cake recipe into a grain free, paleo and low carb snowball cookie with pumpkin pie favor. I am really excited about the results as they tasted even better than I dreamed they would. 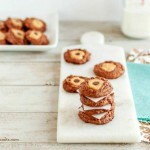 Baked pumpkin pie cookies with a sweet cinnamon coating. Not as crumbly as a tea cake but not as soft as a pumpkin pie. My family loved the texture and taste. These were easy to make, bake and roll in the coating. 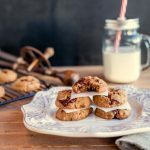 If you like Russian tea cakes or Mexican wedding cakes, then you will love these pumpkin pie snowball cookies. 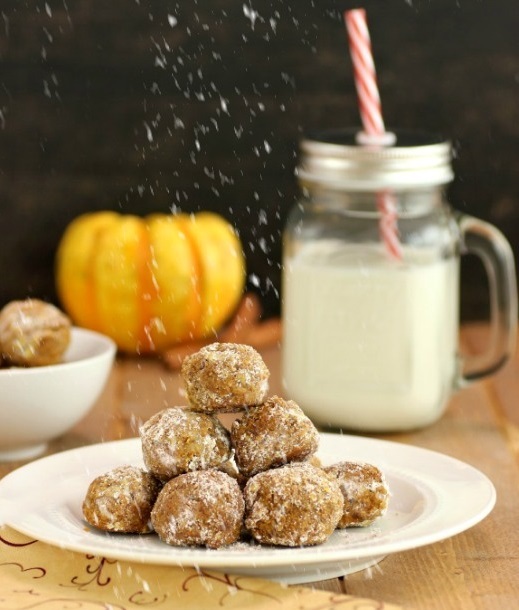 Pumpkin Pie Snowball Cookies are snowball cookies with pumpkin pie flavor. 2 ½ tbsp . powdered sweetener of choice: grind up coconut sugar in blender or processor or for low carb use confectioners erythritol or grind up granular erythritol. Preheat oven to 300 F°, and line or grease a cookie sheet. In a large mixing bowl combine: 1 ¼ cup almond flour, 1 tbsp coconut flour, 1/3 cup sweetener of choice, ½ tbsp. pumpkin pie spice, and ¼ tsp cinnamon. Mix together thoroughly. Add to mixture: 3 tbsp melted butter or coconut oil, 1 egg yolk, and 3 tbsp pumpkin puree. Mix together thoroughly. Add in optional walnut pieces and stir in. In a blender or processor, grind up the 2 ½ tbsp sweetener of choice until it is powdered (unless using a low carb brand of confectioner’s sweetener). Put the powdered sweetener of choice into a small to medium size bowl and mix in the ½ tsp cinnamon. Set aside. Using hands or oiled or buttered hands to prevent sticking, roll a tbsp size of pumpkin dough into balls and place on cookie sheet in rows. 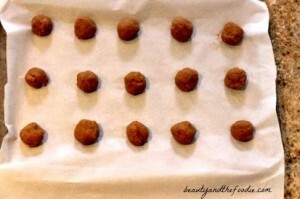 Bake cookie pie balls in oven for 22 to 26 minutes. Check at 22 minutes to see if browning slightly. Remove from oven and cool slightly. 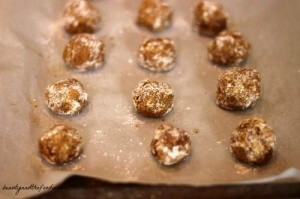 While cookie pie balls are still warm, rolls lightly into the powdered sweetener and cinnamon mixture. Serve and enjoy. Store unused portions in container in the fridge. 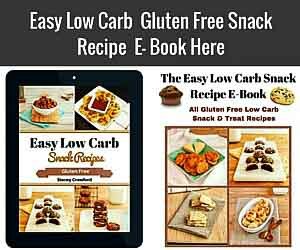 Nutritional Data for Low Carb version using erythritol sweetener ( I used Swerve): Serving Size: 1 ball out of 15 balls, Cal: 81, Carbs:4 g / Net Carbs: 2 g, Fiber: 2 g, Fat: 7 g, Protein: 2 g, Sodium: 18 mg, Sugar: 0 g.
I made these New Years Eve (last night) and they are amazeballs! (haha, play on words) My husband couldn’t stop popping them into his mouth! He begged me to hide them and not bring them out until today. 😀 I loved them too, but have more self-control than him when it comes to sweets. Thanks for sharing such a brilliant recipe! Thank you so much for trying the recipe and your kind words, Michele. Do you think banana would make a good alternative to egg? I did make these tonight with egg and they were amazing! Even my super picky eater loved them. 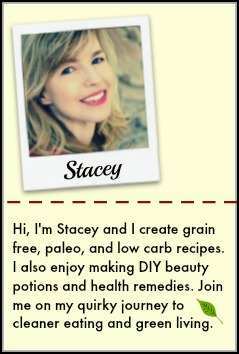 Thank you Kassie for trying the recipe & I’m thrilled the picky eater like them.. 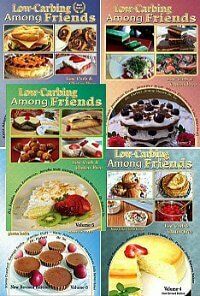 I have not had good results in using most egg replacements in the grain free recipes. I have not tried a banana in this recipe, but I have in others, and I think it needs egg to bind the grain free flour together. I Have successfully used banana in other paleo recipes when I’ve been out of eggs, but wasn’t sure if it works in every recipe. Thank you for responding so quickly. These are so good! Thanks for the great recipe. Thank you Julie for trying the recipe and the tip about warming them! These look like they could be dangerous!!! I have a feeling 10 would disappear quite quickly! What a great twist on the teacake. I love pumpkin…I will have to give these a try. Russian teacakes are one of my all time favorite cookies so it is no surprise that they are always included in our holiday baking. What a genius idea to introduce pumpkin to this tried and true favorite. Lynn, thank you for your very kind words. yummy can’t wait to try this! 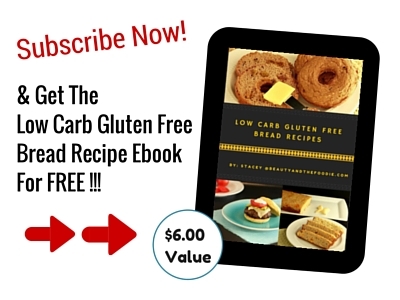 I love the ingredients you used in this recipe, it looks really yummy. It’s so convenience to have these little power snacks around to munch or take on the go. Great job! I love snowball cookies! I bet they taste great with pumpkin!!! I made these today & they are great! I realized late in the prep that I had no eggs – decided to go ahead without the egg yolk & they seem to have turned out just fine. Thank you Runner Girl, I am relieved that they worked out without the egg yolk. It is always nice to have an egg fee option. 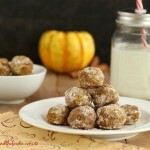 I would love to make these pumpkin snowball cookies but I have recently developed an allergy to terr nuts. 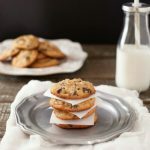 Is there an alternative flour that would work as well as the almond flour? Trudy, I too have issues with almonds sometimes. I used cashews meal in mine in the same amount, but if you can’t have any nuts then perhaps sunflower seed meal may work in the same amount as almond flour. You would have to grind the raw shelled seeds in a processor until a flour texture forms but not too long or you get SunButter. I have not tried it, but it may work.